Back when my kids were small, I had such fun decorating their rooms. A yellow nursery with classic Winnie-the-Pooh accents. . . a rugged little boy's room with fishing rods used as curtain rods. . . an Army-green room with camouflage netting as a window treatment. The rooms grew with the kids, and each one was fun. Now my kids are teenagers, and most of the decorating is left up to them. It's not quite as much fun for Mom, but I think it's good for the teenagers. 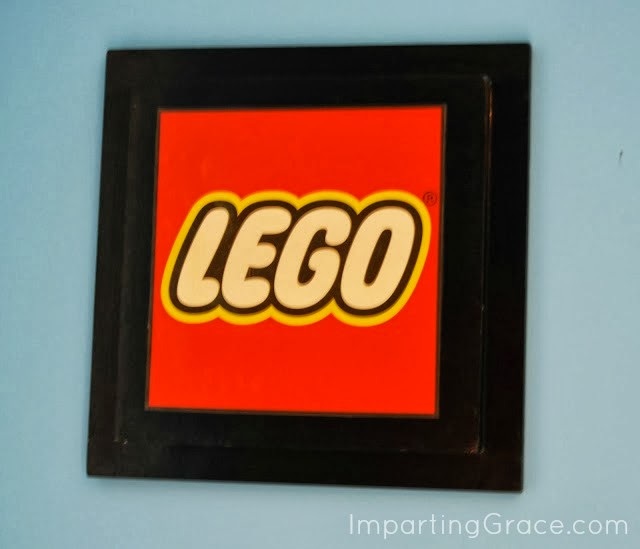 I tried to find a LEGO poster or some kind of LEGO artwork for Lee's room, but didn't have much luck. I did find a couple of limited edition posters, but those sell on eBay for big bucks. What I wanted was LEGO art for not much money. No go. 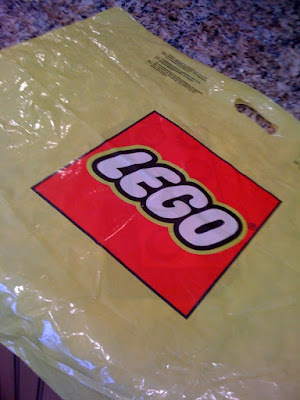 Then one day I was looking at a shopping bag from the LEGO store (we have lots of those around here! ), and a light bulb went on: I should make my own LEGO art. 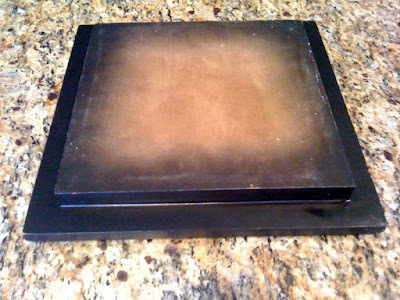 I found this square art board thing in the clearance aisle at TJMaxx. 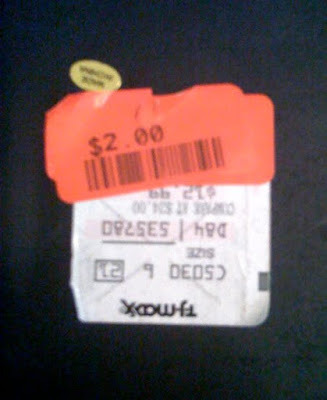 It originally had a piece of decorative paper glued to the front--it was on clearance because that paper was ripped. The rest of the paper came off easily, then I gave the whole thing a coat of black spray paint. I cut out the LEGO logo (say that three times fast!) from the shopping bag and mounted it on a sheet of white paper. Then I ModPodged the logo onto my black square. I like it; Lee likes it; my pocketbook likes it. Hope you like it too! 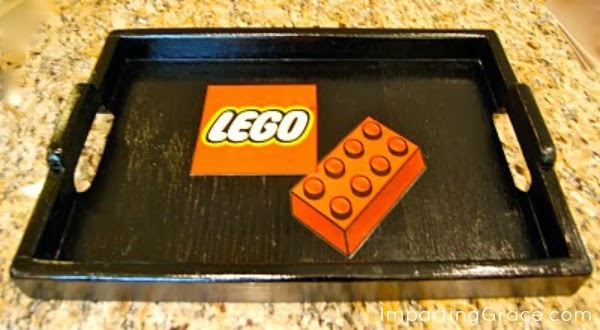 I also made Lee a tray to transport LEGO projects out of a shopping-bag logo. Click here to see that project. Check out all the fun projects at DIY Day at A Soft Place to Land! Super cute! My boys love Legos too. That's a great theme for a teen room. My kids are still 7 and 9 and all about Pokemon and aliens! Super creative idea (and it looks so professional)! I'll bet your son is delighted! Smart mom!!! I especially like the price. Blessings! My younger brother is a Lego boy. He was just telling my mom he wanted to start a blog about legos! Crazy! Love it! My boys love legos too, I'll give this a try! that is so cool... legos are awesome!!! GREAT idea! I'm sure he loves it! Hi, I found you while blog hopping crafty blogs, and i love your blog.I'm following you, and i invite you to come and see my blog sometime. I'm a farmer/rancher's wife and mother of 3 girls, living in South America. Have a great week! That is incredible! Love it. One of my friends has a son (I have so much fun with little boy energy when I babysit since I raised all girls) who is also a Lego fanatic. Their family room looks like a Lego farm. His face just lights and he gets so animated when he shares the pictures in his Lego catalog. Very cute! I don't just like it, I love it! My little boy walked by the computer as I was reading this and said, "Legos! Cool!" Oh, man! Kiddo would LOVE that! He is so into Legos that right now as I'm taking ANOTHER day off from school because of my sinus infection, he's playing Star Wars Lego on the Wii. He loves ALL things Lego. I'll have to see if I can find a Lego store around here!